I was hopping around the food blogs on this rainy day and, since it is raining so much, I've been in a real baking mood. I decided to check out the ingredients for the Royal Foodie Joust and was instantly inspired when I read that the ingredients were whole grains, citrus and ginger. I love these ingredients and instantly decided it was time to whip together (ok, as quickly as they can be whipped together anyway) some madeleines using these ingredients. I have been practising my madeleine making skills for a little while now, but this is the first time I've branched out and tried to adapt a recipe into my own creation. So, while this was meant to be my entry into the Joust, I think I may have been looking at the ingredients after the deadline (not sure) and missed the boat. Either way, these were fun to make and it was really fun to think outside the box for me. For the citrus I used fresh orange zest (in the madeleines) and fresh orange juice in the glaze. For the ginger, I wavered between using ground ginger and fresh, but since I had fresh ginger and it is still (technically, weather aside today) still summer, I decided to go with freshly grated ginger as well. My whole grains of choice were whole wheat pastry flour (which I checked to make sure was whole grain, but did not mill myself) and old-fashioned whole oats (which I did mill myself). It was super fun to mill the oats myself and use some healthier ingredients in the madeleines. I also added some dark brown sugar, well, because I am a serious fan of all things brown sugar. I hope you will give these a try. They really turned out pretty wonderful! Melt the butter and set aside to let cool. In a small bowl, sift together the wheat and oat flours with the baking powder. Set aside. Place the eggs in the bowl of a stand mixer and beat until thick. Add the sugars, orange zest and finely grated ginger and beat until very light in color and texture. Remove the bowl and add the sifted flours and baking powder. Mix together gently with wooden spoon or spatula. Gently add the melted, cooled butter using the spoon or spatula. Mix until well combined. Cover the bowl with plastic wrap and refrigerate for at least 2 hours. Preheat your oven to 420 F.
Grease madeleine molds and fill 3/4 full. Do not overfill. Bake for 5 to 6 minutes (to get the bump); reduce the oven temperature to 350 F and continue to bake for about 4 to 5 minutes more. 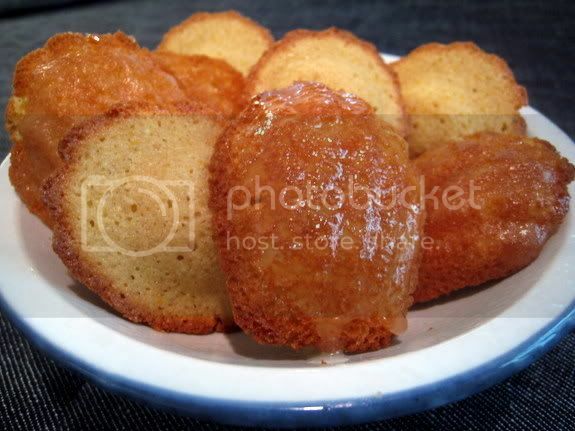 Remove the madeleines from the oven and unmold to cool on a rack. Allow to cool almost completely before dipping the "shell" side into the glaze. Place back on the racks and allow the glaze to set. Whisk together well til smooth and combined - glaze should be fairly thin. Heat briefly in microwave to melt sugar and warm the glaze. Makes about 20 large madeleines or 30 minis. These look great! I've never made madeleines before, but I'd really like to try. This looks like a great creation! 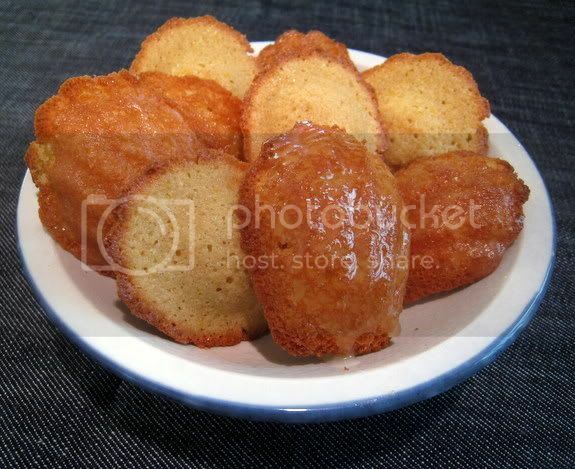 I love this combination for madeleines. They look mighty tasty. These madelines look delicious - what a great recipe! I will have to try these madelines! They look fabulous and I finally have a pan! These sound delicious! Now I just need to get a pan!